Someone emailed me a link to an article by property economist Gareth Kiernan of Infometrics in which he sets out to debunk (pull the legs off) arguments proffered by some self-proclaimed ‘property experts’ like spruiker Dean Letfus in defence of the tax treatment of property investment. …So I don’t buy into the whole “social service” argument. I’ve got a lot of time for Gareth. He’s directly helped me with data for several of my or my authors’ books including Olly Newland’s The Day the Bubble Bursts and aided my meagre understanding of the power of trends in property markets. I talk with Gareth every few months and always enjoy hearing his views. He brings a rigorous, careful analysis of the figures and (as economists do) explains things in terms of hindsight — what’s been happening. That’s not a criticism. I like him and respect him. So his (fairly light, I thought) pre-Budget opinion piece at interest.co.nz is worth reading, whether you agree with everything he says or not. What also interested me (and the person alerting me to it) was some of the reader comments responding to the article which reveal a level of (dis)respect for Dean Letfus. He’s clearly made an impression on some other folks… someone even quoted posts from this blog! Meanwhile, Gareth himself is obviously not too impressed with Dean Letfus either … although I don’t recall ever discussing the subject with him. I remember Dean Letfus (sometimes spelt Dean Leftus) described generally well-respected BNZ chief economist Tony Alexander as ‘a crazed sadistic basher of other commentators’ and suggested he suffered from rabies(!) Hardly a rational suggestion. He also described Olly Newland’s advice as ‘drivel’ before later grudgingly admitting that gee, maybe experienced ‘old school’ type investors like Olly had actually learned some worthwhile things through ‘the crucible of experience’ that Mr Instant Expert hadn’t realized. So it seems fair enough to me that the slick and self-aggrandising “expert” should cop a wee bit of criticism himself. Not sure I would have wasted my time rebutting anything Dean Letfus said……. The sooner Dean Letfus is shut down the better our country will be. You don’t need to worry about Dean Letfus. He is widely perceived to be somewhat of a joke in property investment circles. Whilst he is a passionate speaker and uses God and the poor children of Fiji to pull the heartstrings as part of his slick sales pitch, he lacks content and in depth knowledge. His throw caution to the wind attitude has cost two of my friends severely – one bankrupted, the other committed suicide partly as a result of all the borrowings Letfus’ teachings made him incur. Letfus no doubt has very high property borrowings and he his probably becoming exposed now. As a result he has to sell lots of tickets to his events, and his costly $20K mentoring package (www.millionairemastery.co.nz). It was interesting to find out Dean’s true story on the PropertyTalk.com forums (http://www.propertytalk.com/forum/showthread.php?t=17353&highlight=dean+letfus). So don’t bother about replying or discussing what such a discredited self-proclaimed ‘property investment guru’ and ‘internet marketing guru’ like Dean Letfus thinks. He only thinks of his own back pocket. 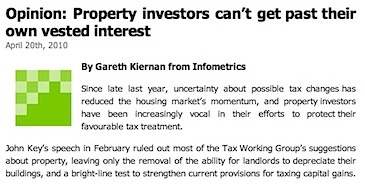 Gareth said: property investors have been increasingly vocal in their efforts to protect their favourable tax treatment. Once again the repetition of favourable tax treatment without explaining what it actually is. There is no tax law that provides favourable tax treatment to rental property in NZ (See IRD and NZ Institute of Chartered Accountants). Every investment has its own set of advantages and disadvantages. To use tax law to make one investment less favourable than another is poor tax law. Shares are more liquid than rental property, so should there be a tax on share transactions? Gareth. What is the favouratism in your view? investors should be indifferent between depreciating or not depreciating their properties. Why? Depreciation would have been factored into their initial purchase decision and has a large effect on cashflow. Having the benefit of depreciation at the beginning of the investment makes it easier to provide rental property. If the property does not depreciate then the money is paid back and the return for the investor is reduced. Statements like this make me think that you don’t have very many good points to make. This is very weak. Gareth, which landlords have said that? A rental property is a business not a charity. The only thing property shark Dean Letfus is good at, is blowing his own trumpet. There’s a saying that we each have the reputation we deserve. Oops. 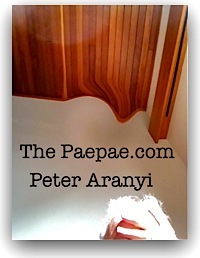 This is entertaining from Peter Aranyi…. “Remember, Dean Letfus (sometimes spelt Dean Leftus) described generally well-respected BNZ chief economist Tony Alexander as ‘a crazed sadistic basher of other commentators’ and suggested he suffered from rabies(!) Hardly a rational suggestion. It seems that Dean Leftus has made his own bed with tainting from being involved with NZ Property Guru’s [sic], Sponge Bay sales in 2007, personally guaranteeing Fiji property investment profits, and now suddenly becoming an internet marketing guru, as well as the ethical mentor. He’s been busy and that’s great, but he’s obviously brassing off well respected people like you, Gareth Kiernan (Infometrics) and Bernard Hickey (www.interest.co.nz) along the way. I think you’re merely scratching the surface. The catalogue of ‘activities’ that this spruiker has engaged in has yet to fully emerge. I was personally surprised at the vehemence of some of the comments about Dean Letfus left on the interest.co.nz thread following Gareth’s article. Who is this clown, Dean Leftus, I receive this constant stream of spam from this person, I have never signed up for anything on that address yet I received this garbage on a regular basis. Any so called financial adviser who used a free site is an idiot. Being a former member of a church where Dean was holding out for a season, I trusted his promises in an busines offer that was “we’ve shown you a working system, now build your own, cash up front to us, and we’ll send you everything you need to get started”. When the actual package arrived, and development was under way, it then became evident that in order to succeed, hard-earned income streams long-established legitimate businesses had to be undermined and sneakily averted, financially injuring them without ever seeing their faces or knowing who they were. Google Shaun Stenning, Dean’s business partner now highly sought after by many who are angry after the business went belly up when it came time for profits and payments to be paid up. Using God to earn trust is not good Dean. From experience, stay well away. it then became evident that in order to succeed, hard-earned income streams long-established legitimate businesses had to be undermined and sneakily averted, financially injuring them without ever seeing their faces or knowing who they were. I completely agree with your sentiment about people (not just Dean Letfus) name-dropping God to gain trust. It’s so awful, that when I observe it happening, my trust sphincter tightens automatically. I see that behaviour as truly discreditable. Hi Peter, my grammer was out of touch there my apologies, it was late. The carefully selected, small window of exposure offered as a presentation of the simplicity and success of an internet marketing business that was demonstrated in one of those “one night only” seminars seemed an honest and legitimate way to use clever computer tools to earn money from creating websites that would receive financial reward for the volume of traffic they received and then forwarded to real business with real products and services. The request was to pay $5000 cash up front for a certain liscence size package, or $10’000 for a larger package. Once payments were confirmed, the passwords were given to access our logins. Once logged in, it was evident that what was being sold was not ready for customer use due to the fact that the system was actually in its very early development phase, not even customer trial phase yet. Those who purchased it and went on line made good use of the “report a fault” tool until we all realised that everyone had experienced the same faults, the resolve time was that of a development package, as in weeks, hence no-one could actually do the business or make money. Dean and his collegues quickly shut down the ability for the users to see what each other was posting on the corporate fault ticket pages so that no one was aware of how raw and faulty their system actually was. Once a few things actually started working to some degree, the process of how one actually goes about learning how to build a money attracting website became evident. It was necessary to use certain gestapo-type investigative tools which went behind open channels, using loopholes (as apposed to being upfront and paying Google and Amazon for the data required) to gather sensitive data relating to the performance of websites that actually belonged to legitimate businesses who were long-standing established companies who used their webpages to market their product, or used the web to market products & services on behalf of a company who needed internet marketing expertise. This package we were in-effect helping Dean and Shaun build by way of experiencing then describing then reporting all the faults and development requirements it still had, showed itself to require us to actually use cunning suggestions that it discovered and presented to the user, suggestions that meant we would have to set up a bogus-type website that deliberately averted traffic (and the income that traffic was worth) away from the genuine website by deviously attracting the pay-per-click and other income attracting methods to our own bogus meaningless groundless product-void website, thus earning money for no genuine effort to provide a service or a product. Cunning, undermining, and borne inside a [alleged] criminal mind. I packed it in the minute this became evident, and received much retort from some of the other followers who remained loyal to Dean, along with an alarming degree of [alleged] lies and resistance from Dean and his [snip] over a long period of emails and phone calls to get the partial refund they eventually and begrugingly gave. Hyperbolically selling something before it is cooked seems to be part of these operators’ MO from my observations.